He let out the most satisfying roar of rage and leaped forward, landing exactly where I'd been sitting only a moment ago. If I hadn't been expecting it, I would have been slammed into a mountain of loose diamonds and emeralds, and my still-soft scales would have been bruised all over. But Jasper was the one who landed there instead, while I joyously pounced on his back and rubbed his snout in the pile of rocks. "Children!" Our mother raised her head from her forefeet and let out a long-suffering snort that blew through the cave, sending more gold coins flying. "Some of us are trying to sleep after a long, hard hunt!" "I would have helped you hunt," I said, jumping off Jasper. "If you'd let me come --"
"Your scales haven't hardened enough to withstand even a wolf's bite." Mother's great head sank back down toward her glittering blue-and-gold feet. "Let alone a bullet or a mage's spell," she added wearily. "In another thirty years, perhaps, when you're nearly grown and ready to fly . . ."
"I can't wait another thirty years!" I bellowed. My voice echoed around the cave, until Grandfather and both of my aunts were calling their own sleepy protests down the long tunnels of our home, but I ignored them. "I can't live cooped up in this mountain forever, going nowhere, doing nothing --"
"Jasper is using his quiet years to teach himself philosophy." Mother's voice no longer sounded weary; it grew cold and hard, like a diamond, as her neck stretched higher and higher above me, her giant golden eyes narrowing into dangerous slits focused solely on me, her disobedient daughter. "Other dragons have found their own passions in literature, history, or mathematics. Tell me, Aventurine: Have you managed to find your passion yet?" Aventurine thinks lessons are boring. She wants to go explore. As it happens, she knows of a secret way out of the cave, big enough only for a very small dragon like her. She'll go out and show her family a thing or two! They'll find out how capable she is of taking care of herself! And then she comes across a human! And he's cooking a pot of something and singing. He won't even see Aventurine as she sneaks up on him. But just as she's about to pounce - she smells what's in the pot. It's amazing! As she goes to eat it, the human stops her. He says it's not ready. It's supposed to be hot chocolate and she really needs the full experience. She watches him work. The smells get even better. I was almost starting to wish that I didn't have to take him home afterward for my family to eat. It would be much more satisfying to keep this human as a pet, to make hot chocolate for me any time I wanted. He would be a hardworking pet, too, I could tell. As he stirred the hot chocolate, he kept on whispering to himself the whole time in that funny rhythmic chant, his whole body taut with concentration. I suppose I could have listened harder, to try to pick out his words, but really, when had I ever cared about anything that humans said? Besides, I was far too busy enjoying the smells from his pot. If I could have, I would have wrapped myself up in those steamy tendrils of scent and rolled around in them for hours. Hot chocolate. Talk about a treasure fit for a dragon! But when the hot chocolate is ready and Aventurine drinks it, first she experiences bliss, and then the world goes black. When she wakes up - her body has been transformed into that of a human girl. Turns out, that human was a food mage. He enchanted her with the chocolate. The food mage is a bit sympathetic of her plight, but he won't change her back - he knows he'd get eaten. He tells her to go into the city and look for a position as an apprentice. She looks to be twelve years old, which is the right age. So - Aventurine must navigate the world as a human. First, she tries to go back to the family cave, but when her grandfather sends a warning ball of flame her way, she figures out that won't work. Eventually, a scheming couple stops for her and takes her into the city. They mean Aventurine to be their maid, but she's not interested. She intends to be an apprentice at one of the city's chocolatiers. She doesn't have any doubt she can do it, since she's the fiercest thing in the city. That's an adventure in itself. Not surprisingly, this isn't as easy as she'd hoped. But with the help of a street girl, she finds a place where her nose for chocolate is enough of a recommendation, and Aventurine begins to learn how to make chocolate. She has found her passion! 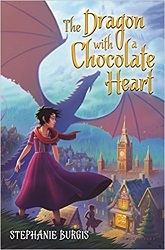 The story of what happens to a dragon in girl form with a passion for chocolate who now must live among humans - is a delight. It will make you hungry, though. I recommend having some chocolate handy if you start reading this book.